I think many adults, me included, have fond memories of free play during our childhoods . . . playing kickball and tag at recess, flipping baseball cards, creating carnivals in the backyard . . . all done without any guidance or interference from adults. These memories are more vivid for me than any time I spent in school. Fast forward to today . . . school recess is shortened or does not exist at all, kids come home from school and sit in front of TVs or computers playing structured games, teens lives are structured with school, sports, social events with no free time. The benefits of play, although hard to measure, cannot be overstated. Lack of creativity and innovation in children’s toys. The symptoms of the play deficit can be seen in the types of commercial toys being bought and sold. Legos provide the perfect example of the changing nature of toys. Many of kids’ toys are promoted and sold with directions, solutions to problems, and expectations for end products. Creativity and innovation are enhanced when directions and expected end products are intentionally omitted from the toy packaging. No free time play time to experience, interact with, and experiment with the real world; toys that lack room for divergent and creative play; and a school system that focuses more on results, accountability, and standardized products has led to a society of less creative children and research provides some evidence of this. If these skills are to be integrated into formal and informal learning settings, some direct instruction and scaffolding will need to occur. The maker movement and education has the potential to do both. So, in essence, the maker movement-maker education can counteract the negative effects that school and our society have had on children’s and young people’s playfulness and creativity. Educators and other involved in curriculum development would need to let go of the focus on deliverables, measurables, and expected products. The process of doing and creating needs to be the focus. The educator should take on the role of lead learner – demonstrating, modeling, and scaffolding the use of the maker education tools and techniques. Educators would need to let go of control and embrace the ambiguity that comes with the messy learning of maker education. A sense of play and fun should be expected as part of these learning activities. In essence, the educator’s role in this learning environment would be a tour guide of learning possibilities. S/he would show learners the possibilities and then get out of the way. The importance of play as part of a child’s development has been the focus of educational specialists and research for decades. Piaget and Montessori have emphasized that a child’s play is his or her work. Children are still playing in this age of technology but the type of play and results are evolving. Lego, with its introduction of the new Mindstorm, created an infographic that describes the changing pattern of kids and young peoples’ use of technology and how it is affecting their development. The future will see the creation of more diversified playful relationships due to the ease of creating an online persona and free networking sites like Tumblr and Youtube. Children will continue to demand more control over complex outputs. Children are creating computer games, movies, their own content. Visual instruction is the way of the future. Kids go to Youtube to learn. They create videos and complex stories via gaming platforms (Mindcraft, Scratch). The boundaries between digital and physical interaction will continue to blur. Kids are growing up with augmented reality toys and body-gesture systems. Customizing one’s toys and play will be an integral of child development. Creative expression via the DIY movement is rapidly growing. Children with share an increasingly amount of humanity with their toys and play. Technology enables children to create, navigate and perform their emotional lives. With touchscreens, simple programming languages, and other lowered barriers for human-computer interaction, kids are poised to gain a high level of technical proficiency. When you combine this access with the resources kids have—time, a highly plastic brain, and the freedom to experiment with new behaviors, interests, and ways of being—it is not hard to imagine a level of empowerment for kids never before seen in human history. The Institute for the Future reinforces some of the ideas the Lego shared. Authorship, storytelling, fantasy, and role-playing will expand into new media. Growing up immersed in virtual worlds, social networks, and YouTube videos, children will develop a different set of expectations for evaluating human proximity and presence, as well as a comfortable confidence expressing their views. Play will be a more fluid material experience, blending the virtual and the physical. Kids will have many fun options to explore depth, sound, gesture, and images. By 2021, kids will expect their digital and physical objects to share more characteristics, including tangibility and connectivity. Kids are global children. Reality for children today is not confined to their room, or house, or school—it is a global community of networked peers and endless virtual horizons. Creating and sharing videos with billions is a normal activity for many kids today, giving them a vastly different perspective on distances, times, and relationship with others than previous generations held. How many educators are teaching in their classrooms the way kids are learning during their own playtime using their own technologies? How many state educational standards address how children are playing and learning in this amazing age of technology? Many teachers, schools, district are not giving kids a chance to play nor use technology in ways that come naturally to them. Let learners bring in their devices (all types – mobile, gaming, robotics) for use in the classroom, to reinforce learning, and for show and tell. Use some educational monies to purchase “fun” technologies – gaming systems, Lego robotics, iPad apps. Give kids unstructured free time play using their and their peer’s devices. See Tinkering and Technological Imagination in Educational Technology. Ask learners to teach you and the class about a technology he or she is using at home. Give learners a choice how they want to demonstrate their content area learning – a video? a online game? a board game? 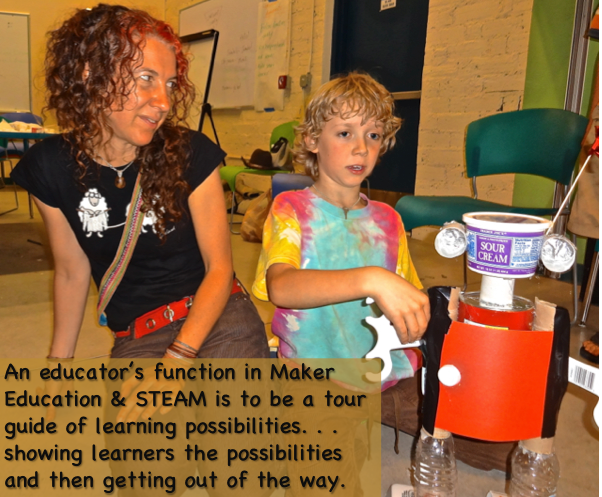 Explore and integrate Maker Education as part of the curriculum. Encourage and provide the time and tools for students to share their learning with a global audience – e.g. Skyping with another classroom, blogging, Tweeting, creating videos and newscast. This pretty much sums it up . . .